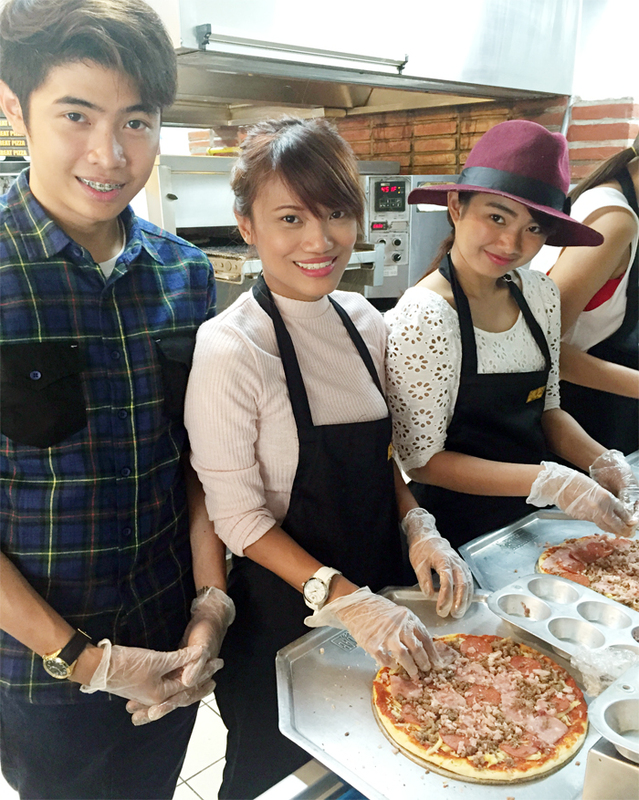 Last May, I attended a super fun pizza party with close blog friends and readers at Yellow Cab, Visayas Avenue. It was such an awesome afternoon filled with laughter, smiles, stories, friends and of course, delicious food!!! Yellow Cab has always been my go-to comfort food. Whenever I feel like rewarding myself or when I feel like pigging out (while watching my favorite TV series), I order my favorite Yellow Cab meal-- Dear Darla, Hot Wings with extra sour cream, Baked Potato Halves (or Charlie Chan pasta), Raspberry Sola and Dark Chocolate ice cream. I know. Lakas maka last supper noh? Haha! Anyway, here's what transpired that day through photos! Hello to my beautiful reader, Cherie! Thank you for coming!!! :) Hi din daw sabi ng matakaw kong jowa sa gilid. Lol. I really heart Yellow Cab's interiors. So artsy. Feels like I'm in New York na din. Ready to rumble! Damang dama ko yung apron. Feeling chef. We each were given plain dough which we needed to fill with their signature pizza's ingredients. It was not that easy! We had a hard time figuring out where to put the rest of the ingredients (after the 3rd one) next. Ang damiiii. Overflowing. Which is a good thing! You really get your money's worth! Plus, they only use fresh ingredients. The work place is also very neat and sanitized. Tada! Ready for the oven na! Can you see the heart? Haha. The pizza making team! Haha. Ashley tried to make a smiling face pizza! But too much ingredients killed the dream. Hehe. Waiting on the other side. Haha. Top shot just because. Haha.